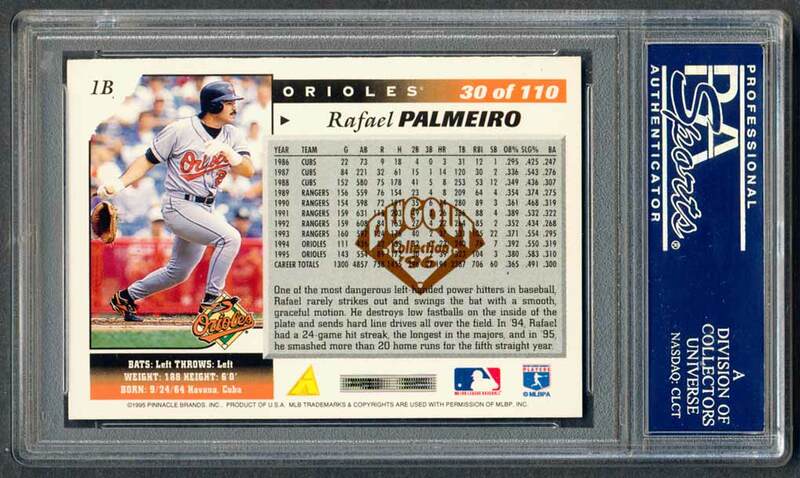 Comments: For Palmeiro, I settled on the 1996 issue and purchased a Dugout Collection parallel in February, 2005 followed by an Artists Proof example on eBay in July, 2005. The AP was submitted to GAI and graded NMMT+ 8.5. I've been looking for an upgrade ever since. This card reminds me of a funny memory. I was in Toronto on a business trip and went to a Blue Jays game. I don't recall the year. But, I got some great seats and sat in the first row behind the visitor's dugout. There was an inch-wide gap between the back wall of the dugout box and the roof. I couldn't see into the space but I could yell. When the Orioles were up to bat I would yell - "Raffy, Raffy, Raffy" into the dugout for the entire half inning. After three outs were recorded the defense took to the field. Rafael Palmeiro came out of the dugout, looked at me, smiled and shook his head laughing. A couple weeks later the steroid allegations came up. I still like the guy for laughing it off and not being a jerk to me." UPDATE: I purchased and submitted a non-Artists Proof Dugout Collection single in 2013 but it came back graded NM-MT 8 in August. UPDATE: My mother in law gave me an Amazon gift card for Christmas. I used it to buy some team bags. Then, on January 7, 2013 I found (3) AP Palmeiros on Amazon.com for $13.44 inc. S&H being sold by Burbank Sportscards. We'll see if any of them are worthy of a PSA submission and a potential grade bump when they arrive. 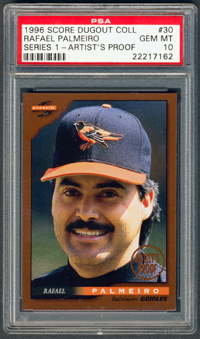 UPDATE: In late 2013, I submitted a copy of the card I purchased in October, 2013. On January 29th, the card came back from the grading company. This GEM was included in the package and I was ecstatic. I should have held off buying the three extra copies via Amazon just a month earlier.